You don’t need to travel all the way to the Sahara to watch a desert sunset. 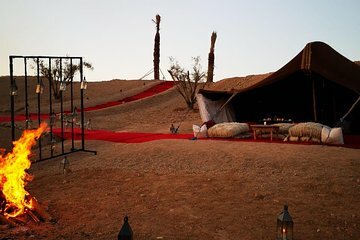 Experience the magic of the setting sun and the starry desert sky with a private 3-course dinner in the Agafay Desert, just 19 miles (30 kilometers) outside Marrakech. Traveling door to door in a private vehicle, savor refined Moroccan cuisine and the freshest seasonal produce amid an atmosphere that’s simply unforgettable.